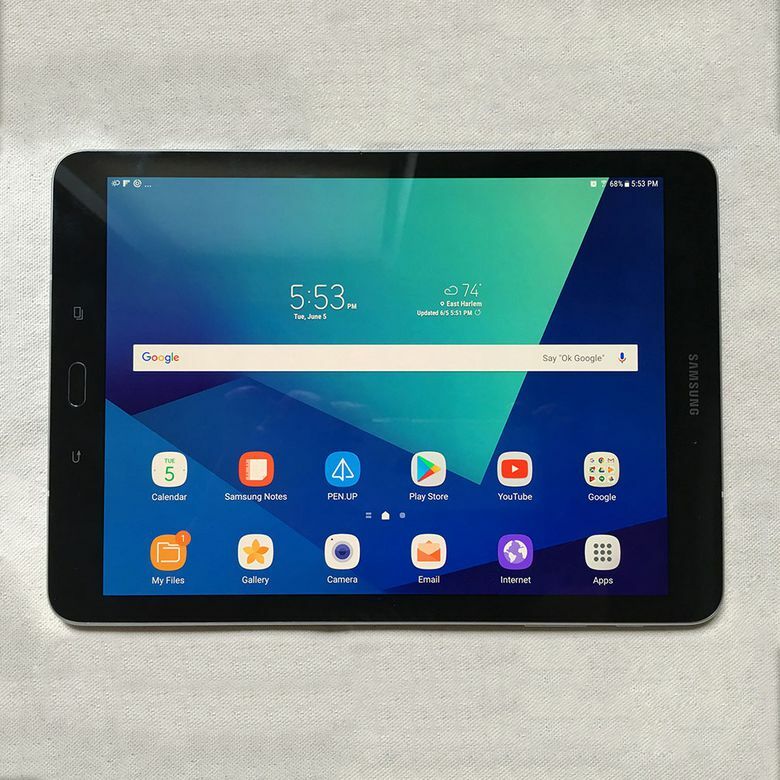 The Galaxy Tab S3 may not be Samsung’s newest Android tablet, but for buyers on a budget, it offers a lot of value with its crisp, high-resolution screen, outstanding audio, and all-day battery life. The Samsung Galaxy Tab S3 isn’t the latest and greatest, but you wouldn’t know it just from looking at it. The slate comes with a high-resolution 9.7-inch screen, an all-day battery, and an S Pen stylus that makes digitally writing on the display simple and fun. Although it might not be as powerful as the new iPad Pro or the Galaxy Tab S4, for many users who want a reliable multimedia experience and don’t necessarily need all the bells and whistles, the Tab S3 gets the job done. We recently tested the Galaxy Tab S3, using it for multimedia, writing, and productivity. And as expected, the tablet delivered the level of sophistication and quality we’ve come to expect from Samsung slates. The Galaxy Tab S3 we tested has a black finish, though silver is also available. The slate measures 9.34 x 6.65 x 0.24 inches and weighs 15.13 ounces. The black version has a sleek look, but the back is glossy, so you’ll find yourself wiping off fingerprints often unless you use a case. Fortunately, the back is flat so it won’t go sliding off your desk despite the slick finish. On the front, Samsung has the same black, glossy finish with a Samsung logo at the top. On the bottom bezel, you’ll find a physical home button that you can use to navigate. There are also two capacitive buttons on both sides of the home button. While we found the home button to be reliable and well-built, the capacitive buttons can be a little less responsive. Along the left side of the tablet, you’ll find buttons to control volume and lock the screen. There’s also a set of magnetic connectors that allows you to connect the Galaxy Tab S3 to a separate physical keyboard to use it more as a laptop. On the bottom, you’ll find two speaker grilles, a USB-C port, and a headphone jack. The Galaxy Tab S3 has a quad-core Qualcomm Snapdragon 820 processor and 4GB of RAM. This was strong hardware when the tablet released last year, but it’s on the older side now. That said, the Tab S3 still did a solid job of handling most tasks. When we were flipping around to different apps and surfing the Web, the tablet did a great job of handling multitasking without any sign of slowdown or poor performance. If you plan to use the slate for a lot of graphics-intensive apps, like 3D drawing programs and games then you might notice some stutters. The average user planning to watch some videos and do some browsing shouldn’t have any difficulty. The Galaxy Tab S3 ships with an S Pen stylus that you can use to make quick notes or draw with the built-in Samsung apps. You can also use it to magnify a part of the screen and create a palette of colors for your artwork. The best part is the stylus felt like a real writing instrument. Drawing was effortless and at no point did we suffer from any lag when writing on the screen. The Galaxy Tab S3’s display is 9.7 inches and uses Super-AMOLED technology. It has a quad-HD resolution of 2048 x 1536. All of that translates to the Galaxy Tab S3’s display being downright impressive with the resolution matching or surpassing other high-end tablets. Whether watching videos or surfing the Web, the display delivered outstanding visuals with perfect brightness and color reproduction. It looked great in both high- and low-light conditions. The Tab S3 also comes with HDR10 support, a technology that allows the screen to work with high dynamic range (HDR) content. To put it simply, HDR expands the brightness spectrum of a picture and creates richer colors in every scene really making them pop. We saw a big difference in color and contrast between HDR and non-HDR content. The Galaxy Tab S3 has quad stereo speakers that have been tuned by its own in-house audio experts at AKG. Better yet, the speakers are also auto-adjusting, so they can deliver pitch-perfect tunes in any environment. In our testing, the Galaxy Tab S3’s speakers sounded downright outstanding. There’s no tinniness like you’d find in other tablets and real depth to both the bass and treble. We were really impressed by the tablet’s sound quality. Samsung’s Galaxy Tab S3 boasts a 6,000mAh internal battery. Samsung promises eight hours of Internet use time, 102 hours of continuous music playback, and up to 12 hours of video playback. During our testing the battery life was in line with what Samsung said. We used the tablet like regular users might, picking it up throughout the day to check email, go on the Internet, type documents, and have video calls. The slate was able to last throughout the workday — about 8.5 hours — before it needed to be recharged. The Galaxy Tab S3 comes with a 5-megapixel front-facing camera and a 13-megapixel sensor with autofocus and flash. The front-facing sensor does an outstanding job of making you look good on video calls and its autofocus is both fast and accurate. Selfies, on the other hand, were a little bit disappointing. Facial details were soft and contrast was a problem. The rear-facing camera offered only passable results compared with the average smartphone. Whether we took pictures of landscapes or attempted to snap minute details in flowers, the pictures looked grainy and detail was lost. Even color reproduction was off, causing bright reds and yellows to look somewhat dull in comparison. You’ll find Android 7.0 Nougat in this slate, which is pretty dated considering two other Android versions that have released since Nougat. If you can get past that, you’ll find Samsung’s own Experience software skin over Android. Experience is Samsung-only software the company has developed to create a unique experience in its smartphones and tablets. It’s designed to work atop Android, so Samsung can take full advantage of Google’s software while offering a customized user interface. Samsung Experience works reasonably well as a tablet skin. It has a simple design that makes it easy to find content in folders and pages of apps and since Samsung updates it each year, it tends to get better with age. Best of all, Samsung has designed it to complement the Google experience instead of taking away from it, so if you’re someone who relies on Google apps like Gmail, Chrome, and YouTube, you’ll find them all easily accessible. Other Android apps can be downloaded from the Google Play Store. That said, not everyone is so keen on getting a device with bundles of Samsung bloatware loaded onto the tablet as soon as they break it out of the box. And although many of those apps, like Samsung’s Notes app, work extremely well on the Galaxy Tab S3, you’ll more than likely find yourself not using much of the pre-loaded software. It may seem strange to recommend an older tablet when people are usually looking for the newest hardware, but the Tab S3’s biggest selling point is the price. Available anywhere between for $379 on the lower end and $449.99 on the higher end, it’s hundreds of dollars cheaper than the $649.99 Tab S4 and the $799 11-inch iPad Pro while offering a similar set of features. The specs may not match up, but if you’re on a tight budget the Tab S3 is worthy of consideration. If you look around in the marketplace, you’ll find that there are newer tablets available that come with more features and power than the Galaxy Tab S3. If you compare the Tab S3 to Samsung’s newer Tab S4, the main differences come down to spec improvements like a faster processor and some subtle design tweaks like narrower bezels and a removed fingerprint sensor in favor of face recognition. There is some value to be found in Samsung’s DeX platform which functions as a desktop experience for the Tab S4 giving you a genuine laptop experience, but if you don’t need the extra productivity features offered, then the Tab S3 is a much more affordable alternative to the Tab S4. It’s impossible to talk about the tablet market without addressing the thousand-pound gorilla in the room — the Apple iPad Pro. Available in both 10-inch and 11-inch models, the iPad Pro has some similarities to the Tab S3. Both have a front dominated by a rich, high-resolution screen, great audio capabilities, and support for stylus and a keyboard attachment. They also appeal to the same set of consumers who want a great multimedia experience mixed with the ability to do drawing and productivity tasks. That said, the difference between Android and iOS is large. Both have their own separate app ecosystems and if you’re already an owner of Apple devices you’ll likely prefer the iPad Pro even if it comes at a higher cost due to better integration with your other devices. You can also check out our full list of the best tablets on the market today, as well as our picks for the best Android tablets and the best drawing tablets. Multimedia and productivity in an affordable package. The Galaxy Tab S3 may be old, but it has an outstanding design and compelling list of features for the price, including a gorgeous screen and outstanding audio. The older processor does cause some hiccups with high-end gaming, but for watching videos, writing, and productivity the Tab S3 is a winner. Product Dimensions 9.34 x 6.65 x 0.24 in.